In what could be the next episode of the bizarre takeover battle for IVRCL Ltd (BSE: 530773, NSE: IVRCLINFRA), an FII arm of Swiss banking major UBS AG, on Friday, 27th April 2012, bought 16.31 lakh shares of the infra company. This significant buy by Swiss Finance Corporation (Mauritius) Ltd, a UBS subsidiary, was disclosed by National Stock Exchange on Friday, after trading hours. UBS has been in the thick of the controversy brewing between IVRCL’s promoter E Sudhir Reddy and takeover aspirant Subhash Chandra of Zee / Essel Group. On Friday, Swiss Finance Corporation pumped in Rs. 10 crore to buy a 0.61% stake in this buzzing takeover target. 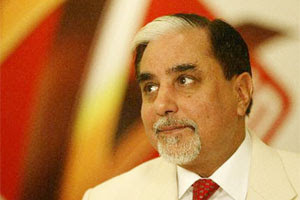 UBS got involved in the battle when billionaire Subhash Chandra divulged recently that the Swiss bank had approached him some months back with a mandate from Sudhir Reddy to sell his stake, if Essel was interested. The Essel chief also hinted that he had declined that offer as the price Reddy was supposedly quoting through UBS was quite high. Later, when the market and IVRCL had corrected significantly, Essel had gone forward and bought a 12.3% stake through open market purchases that kicked off the takeover battle and sent the share price soaring. But Reddy was prompt and quite vocal in denying that he had appointed UBS with any such mandate. Going one step further, the IVRCL promoter recently also threatened to sue UBS if it doesn’t disclose that what Chandra was saying is false. Essel Chairman on his part stuck with the story, and further divulged that he was backing off from a full-fledged takeover as the concerned investment bank had conveyed to him that IVRCL promoters are no more interested in the deal. StockExplain had earlier reported that this might be only a clever strategy to acquire at lower levels, and this seems to have been the case when JM Financial, the Group advising Essel on the deal recently divulged that it had upped its stake in IVRCL to 5.04%. It remains to be seen what is the motive behind Friday’s buy by the UBS arm. Swiss Finance Corporation (Mauritius) Ltd is an active FII in the Indian market, and theoretically it can be argued that IVRCL is just a value buy as it has corrected by over 18% from its monthly high of Rs. 75.20. And compared with a recent buy by Merrill Lynch at almost Rs. 74 a share, which StockExplain had reported on, Friday’s buy at Rs. 61.33 definitely looks safer. However, the allegedly active role played by UBS in the takeover drama is sure to raise doubts whether it is acting in tandem with Essel Group, much like JM Financial. Compounding the confusion is the fact that UBS Investment Research had downgraded IVRCL to ‘Sell’ recently, citing strong outperformance. Meanwhile, IVRCL’s Share Holding Pattern (SHP) for Q4 was published recently, and as StockExplain had noted earlier, the real winners from the takeover battle have proved to be a few institutional investors in the counter. Institutional sellers who made best of the unwarranted rally include Government Pension Fund Global (Norges Bank), HSBC Global Investment Funds, ICICI Prudential Life Insurance Company, Bajaj Allianz Life Insurance Company, The Master Trust Bank of Japan, Aviva Life Insurance Company, Tata Trustee Co, and Dimensional Emerging Markets Value Fund. Selling pressure continued in the counter on Friday, despite UBS arm’s significant buy, with IVRCL closing down by 3.07% at Rs. 61.60 in NSE.